Food preparation is one of the important factors to make your food healthy. From the time you buy it in the market, the tools you used in cutting and washing them, up to the way you keep them. To maintain food healthy and delicious is a must in our everyday lives. We buy efficient cooking equipment, best utensils and convenient food containers in order to achieve good and healthy food. Like Lock & Lock that are known for its innovative and airtight food containers. Lock & Lock uses materials that are safe for use in the cooking process. Recently as Lock & Lock launches new cookware and glassware, they also introduces the newest endorser of the brand. The Soap Opera Queen Judy Ann Santos-Agoncillo is the the new face of Lock & Lock. 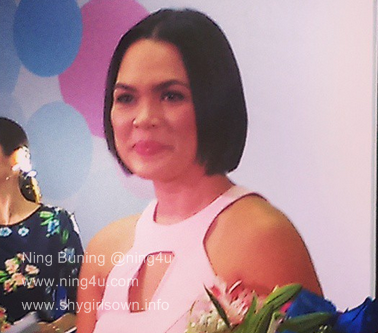 Judy Ann is a great wife and mother despite her busy schedule in showbizness. "I am so happy to be part of the Lock & Lock family, ever since din naman, I really use the brand for my food preparations and keeping. Talagang sealed na sealed ang mga containers nila, that's why i love their products" Judy Ann shared. Lock & Lock E-Cook includes Speed Cook Series boasts of being able to cut off half the needed cooking time; Ceramic Series, is a PFOA free non-stock pan with ceramic coating which easily and evenly distributes heat, saving time and energy in cooking; Deco Series, affordable line of cookware; Prima Series, made of forged aluminum with a ceramic coating and is PFOA free with a non-stick surface and Hard and Light Series, a cookwares that will let your family have years of cooking fun and convenience. Lock & Lock Glass wares are known in the industry for year now and the newest one is the Borosilicate Glass, the ones that can withstand temperatures up to 400 degress celsius. It also has Locc & Lock signature air tight lock and four locking system and is salt,stain and odor resistant. Lock & Lock is available in all leading supermarkets nationwide.